The Texas Transportation Institute (TTI) and INRIX have just released their latest data set on traffic congestion, the 2015 Urban Mobility Scorecard. The findings are not particularly comforting—U.S. traffic congestion is now worse than pre-recession levels. In 2014, drivers in U.S. urban areas are estimated to have wasted more than 3 billion gallons of fuel—equivalent to approximately eight entire days of U.S. gasoline consumption—and 6.9 billion hours sitting in traffic. 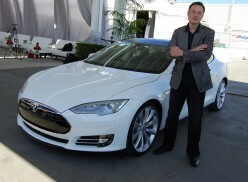 This waste comes at an estimated total cost of $160 billion. Since falling back in 2008 and 2009 (during, and in the aftermath of, the Great Recession), fuel wasted, hours, and cost have all steadily increased. In the nation’s capital—the U.S. city with the worst traffic congestion—delays reached 82 hours per commuter in 2014, resulting in excess fuel use of 35 gallons per commuter, and a total estimated cost of more than $1,800 per commuter. Larger cities experience higher levels of traffic congestion generally with delays at an estimated 63 hours per commuter versus the nationwide average of 42 hours per commuter. Nevertheless, TTI finds that traffic congestion is worsening in cities of all sizes and can be a problem at any hour, not only during morning and evening “peak” periods. In the nation’s capital—the U.S. city with the worst traffic congestion—delays reached 82 hours per commuter in 2014, resulting in excess fuel use of 35 gallons per commuter, and a total estimated cost of more than $1,800 per commuter. 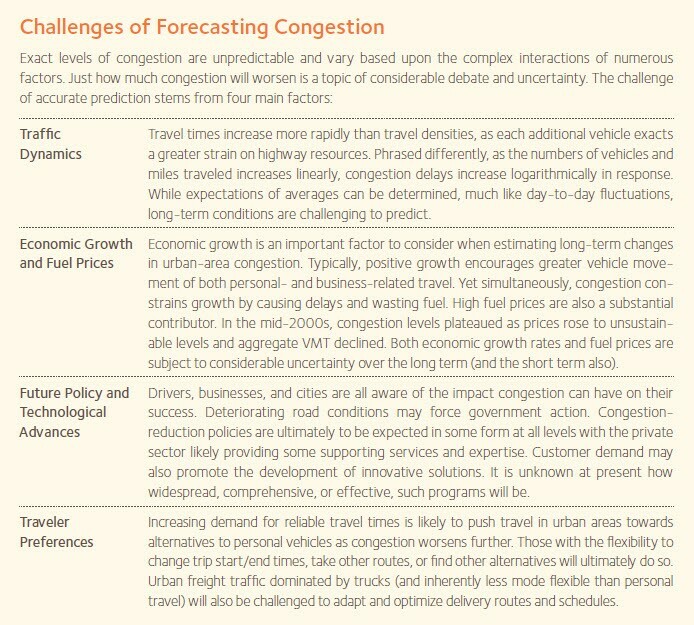 TTI also highlights that uncertain variation in daily traffic volume renders travel times increasingly unreliable, meaning that if someone wishes to arrive on time, greater planning and travel time is needed for all users of the system. These “buffers” are largest in peak periods, when average congestion levels are already at their height. TTI estimates, for example, that for a typical 20-minute evening commute (achieved when there are few other vehicles on the road) requires an additional 35 minutes of “planning time” to reliably arrive on time for those commuting in cities home to more than 1 million people. The average evening commute time was 27 minutes. Overall traffic congestion tapered off in the years following the financial crisis. But as predicted by TTI, in previous years, these higher levels of congestion returned as soon as the economy strengthened and employment rose. Delays are now in fact approximately 5 percent higher than the pre-recession peak in 2007. TTI expects this trend to continue to worsen in the future. The average commuter is forecast to encounter an additional 5 hours of delay (+12 percent) by 2020, and total wasted fuel to rise to 3.8 billion gallons (+23 percent). The average commuter is forecast to encounter an additional 5 hours of delay (+12 percent) by 2020, and total wasted fuel is to rise to 3.8 billion gallons (+23 percent). Securing America’s Future Energy’s Congestion in America, released in 2012—a follow-up report to Transportation Policies for America’s Future, released in 2011—spotlighted the growing challenge of traffic congestion on U.S. roads and potential solutions to it, including several of those solutions referenced above. These two reports emphasized the important interaction between transportation policy and U.S. oil dependence, outlining a vision for a more efficient, analytically-rigorous, and market-driven approach to national transportation policy. 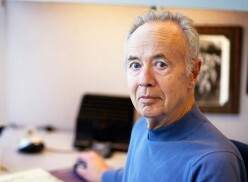 Regardless of whether one agrees with TTI’s methodology or suggested solutions (and there are several who do not), few dispute that traffic congestion is a challenge faced by the U.S. transportation system, and it does have severe implications for productivity, fuel, and health costs, to name just three. Today, gasoline prices are roughly 25 percent lower than they were at this time last year, vehicle miles traveled (VMT) continue to rise, and sales of SUVs (and other generally less efficient vehicles) have rebounded (see Slide 6). 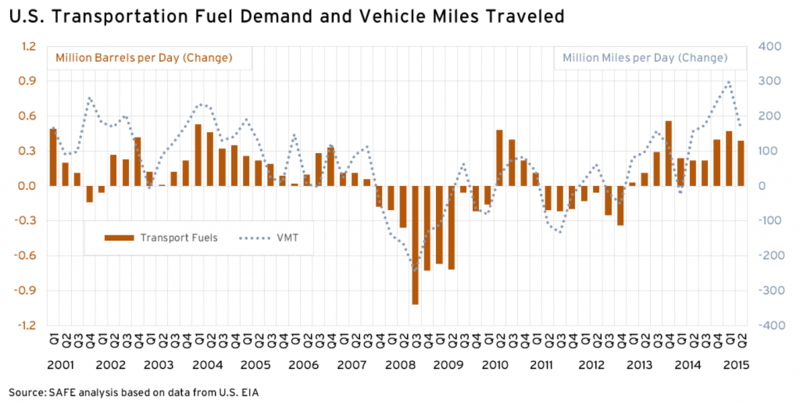 In fact, U.S. VMT has increased for five consecutive quarters while demand for gasoline, diesel and jet fuel has steadily increased since 2013. These lower fuel prices are undoubtedly a boon for drivers in the short term, but don’t encourage much optimism for traffic congestion generally, or TTI’s 2016 update. 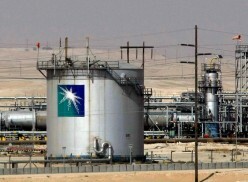 What Will Happen to OPEC, Oil Prices After the Aramco IPO?